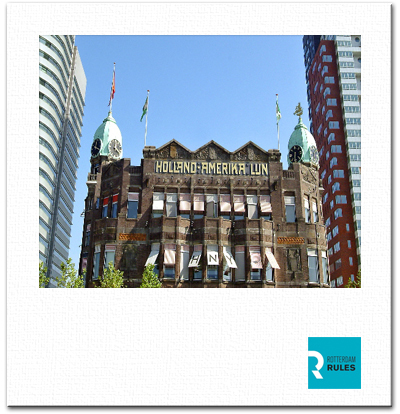 As the city of Rotterdam was heavily struck by World War II, you should not expect too many historic buildings. However, what you will see is that Rotterdam worked hard to rebuild and doing so, was not afraid to go for certain architectonic adventures. Besides, water, ships, trade and transportation are key words in this city full of energy. is the second largest municipality by population in the Netherlands, after the capital Amsterdam, and the largest city in the province of Zuid-Holland (South Holland). The port of Rotterdam is the largest in Europe and was the world's busiest port from 1962 to 2004, until it was overtaken by Shanghai. Rotterdam is situated on the banks of the river Nieuwe Maas ('New Meuse'), one of the channels in the delta formed by the Rhine and Meuse rivers. The name Rotterdam derives from a dam in the Rotte river. Settlement at the lower end of the fen stream Rotte (or Rotta, as it was then known, from rot, 'muddy' and a, 'water', thus 'muddy water') dates from at least 900. Around 1150, large floods in the area ended development, leading to the construction of protective dikes and dams, including Schielands Hoge Zeedijk ('Schieland's High Sea Dike') along the northern banks of the present-day Nieuwe Maas. A dam on the Rotte or 'Rotterdam' was built in the 1260s and was located at the present-day Hoogstraat ('High Street'). On June 7, 1340, count Willem IV of Holland granted city rights to Rotterdam, which then had approximately 2000 inhabitants. Today Rotterdam has some 590.000 people living and working there.